New Album 'Where Stories Unfolds' feat. 60-piece Orchestra! Out on Jan 23rd 2015! 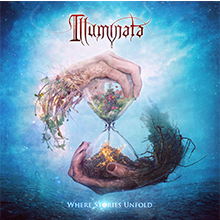 With Illuminata’s newest release Where Stories Unfold, their unique and refined style is even more dominated by a strong presence of orchestral elements. The album is heavily influenced by recent ‘larger than life’ blockbusters movies and combines two of the most powerful genres, Heavy Metal and Film Music. Finally, the band’s cooperation with the prestigious, 60-piece Czech Film Orchestra and the overall top-notch production culminates in a one of the most vibrant, emotional and innovative releases in the genre to date. Welcome to Hollywood!